The 1957-founded Chiang Saen National Museum was originally constructed to safely house the multitude of local archaeological finds. Browse places to stay in Chiang Saen on Agoda.com. Free cancellation. More recently, it has been developed into a purpose built, well lai- out, two-floor exhibition building. Since the area has been inhabited for some 15,000 years there’s no lack of subject matter and exhibits cover the entire time frame. Chiang Saen Noi, a few kilometres south, and the remains of a town on the opposite Lao bank, are contemporaneous with Chiang Saen itself. Exhibits in the museum then cover early habitation of the area; Neolithic, bronze and iron ages through the heyday of the Mengrai dynasty period, the town’s chequered later history and up to the present day, on which there are displays of local hill-tribe culture as well as that of other ethnic groups such as Tai Yuan, Tai Lue and Shan. 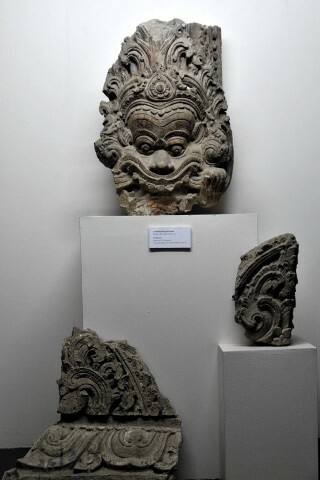 There are a lot of mediaeval period artefacts recovered from local ruins but it’s not only a load of old Buddhas. We’d allow 30 minutes to an hour, though they did say once we’d purchased a ticket we could pop in and out anytime. Across the road, opposite the museum, is a small exhibition centre with more photos of before and after the restoration of various temples and general historical info on the town. Both spots are very good sources of maps and brochures. In fact, we’ve rarely seen a town with so many brochures on offer. There’s a museum guide, a temple guide, ones on walking tours, cycling tours and Chiang Saen history -- this pile of glossy pamphlets alone is worth the 100 baht, but even if you don’t wish to visit the museum and you ask nicely, they’ll give you some info anyway -- or just see what they have in the free exhibition centre.